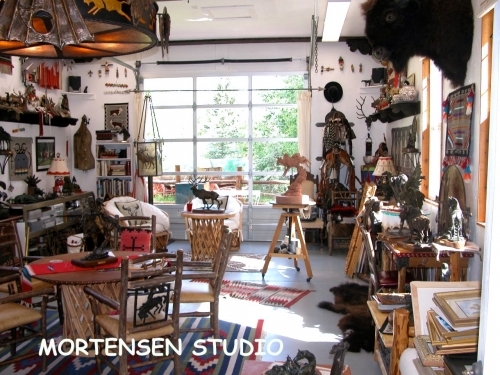 Situated on Fish Creek in Wilson, Wyoming at the base of the Teton Range, is the Mortensen Studio Compound. 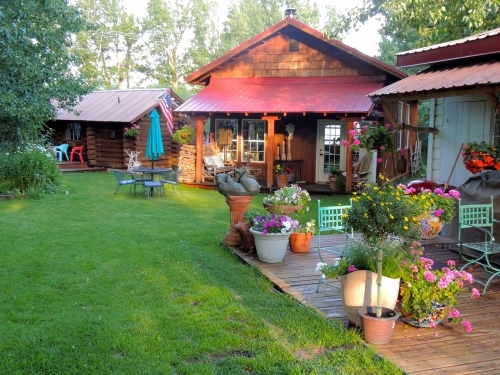 It includes the 100 year residence, listed with Teton County Historic Preservation Board, the artist's Studio, and the historic GP Bar guest ranch cabin. It was built in 1927 by my wife, Pam's, grandfather's ranch overlooking Green River Lakes. A window to the Ranch's history, culture, tradition and spirit is preserved there. There is also an extensive outdoor sculpture garden of Mortensen's creation along the banks of Fish Creek, where bronze sculptures inspired by and interactive with abundant wildlife. The interior of the home and Studio reflects a life-time of collecting the cultural landscape of the West and Southwest, as well as many original lighting and western furnishings. Visitors are welcomed to 40 years of original bronze sculpture, western furnishings and paintings by a single artist. Life-size, as well as smaller works, are created in the Studio. Works in progress are always present.